Tony: Come on, you sound like my shrink! Tony: I'm not ashamed to say I got problems like anybody else. Margaret: Well, I'm not, trying to insult you. I mean, I've got problems, too. I've been going to a therapist for five years, but you're a hired killer. Margaret: No, a job is selling real estate! "Faithful" directed by Paul Mazurski doesn't add anything to his otherwise prestigious resume. As a comedy director, Mr. Mazurski has done better. Unfortunately, he doesn't appear to have been inspired, by the story or by his cast. In fact, one of the worst things in the film is the overbearing role of Chazz Palmentieri, whose Tony is one of the most obnoxious things he has played in the movies. 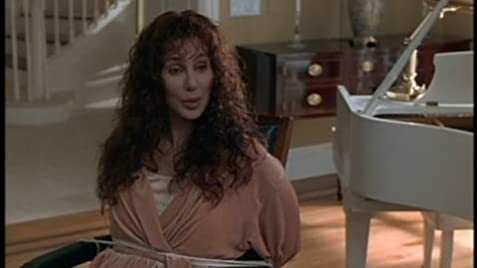 Cher, as Margaret, the redheaded woman, married to a rat fink, doesn't bring anything new to the screen. She could do much better, but unfortunately, not here. Finally, Ryan O'Neal doesn't have much to do. The best thing about "Faithful" is its 91 minutes running time! Sorry Mr. Mazurski, you need to stay away from whoever told you Chass Palmentieri's screen play had possibilities.